I created that poster years ago while my kids were little. I’ve made countless posters over the years but this one, though the actual poster has long since been gone, stayed in my mind. I remember the comfort of the message. I remember using the words to help others, including my own children. Never in my wildest imagination (and I have a WILD imagination) did I ever think that this message would become a life-line for me and my own marriage! I know that my own personal healing from trauma and the rebuilding of my marriage will happen only through the healing power of Christ. I love the visual I see in my mind of actually inviting Christ to lay his healing hands upon me. 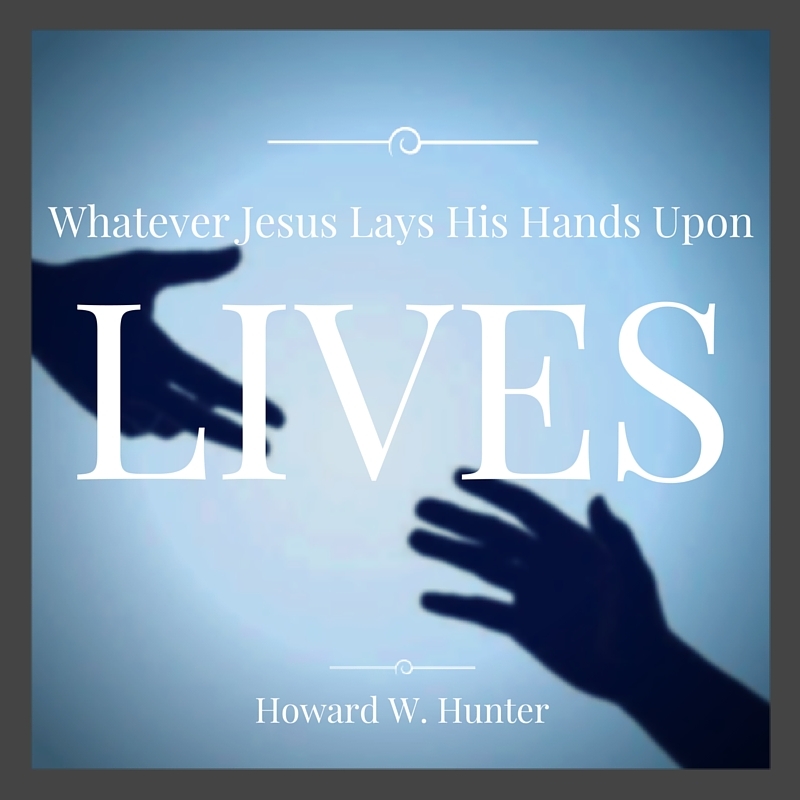 It is interesting that President Hunter uses the word “lives” to describe the effect of the Master’s hands. To “live” is more than survival. It means to thrive, to be aware, to be part of something vital and organic. Something that “lives” is able to change, grow, and heal. I cannot live in the past and expect my life or my marriage to be the same as it was before D-day, when I learned about my husband’s transgressions, if I want to heal. I must embrace the opportunity to make a new and better life, to change and grow. I want to do more than survive my trauma from betrayal. I want to thrive and live! I want to heal and be whole. I think the next time I kneel in prayer, I’m going to envision the hands of the Savior reaching toward me. I’m going to work on actually feeling his touch. I’m going to see his hand in mine and let him lift and raise me to a new and better life. My church leader told me that God knew I could handle the challenges of my husband’s infidelities. He said I was strong and faithful, so I am able to deal with this trial and that I was chosen for this experience. Here’s the deal. When people were signing up for this life’s coursework, I am pretty sure, actually, I’m absolutely sure that I didn’t sign up for this. If I did, I was confused and didn’t know what I was doing. I don’t feel qualified to take this course. If I was chosen, then I think somebody in charge has overestimated my abilities! First of all, I’m fairly certain that I filled up my schedule of life courses with other things. I’ve already completed studies about losing a child, enduring critical financial setbacks, watching a child wander spiritually, experiencing minor health issues, and overcoming mental depression. Interspersed between these, I attended various short labs dealing with torn friendships, unfulfilled expectations , and self-defeating behaviors, to name a few. Clearly, I have already fulfilled enough coursework for my life and really don’t need more education, especially this particular curriculum that requires so much homework and extended class time. Though I have already taken a variety of courses, none seemed to prepare me for the advanced course of spousal betrayal. Surely, I should have taken some pre-requisite courses such as “how to identify deceit” or “how to prepare for emotional trauma bombs.” My studies in the past should have included some emphasis on addictions to better prepare me for this advanced work. Obviously, I am not educationally qualified for such a challenging course. It should be noted that I have no desire to shirk my responsibilities. I think my past transcripts will show that I have attended church regularly, obeyed the commandments as best as I could, and I have devoted most of my time and my energy on my family. You see, my declared major was focused on building an eternal family. I’ve been enrolled in something that is the antithesis of my life’s work. Surely, this sets me up for a possible failing grade as I struggle to learn all new terms, philosophies, and concepts. How can any of this be fair? I hope you will consider taking me out of this class quickly and return me to the educational pathway I was previously persuing. After conferring with your professors, it has been decided that whether or not you signed up or were chosen for this coursework, you will continue your studies until you are eligible for graduation. We understand that you may feel your past experiences are inadequate in preparing you for the rigor required to pass this curriculum. Please know that you may take advantage of our divine tutoring program which is available 24/7. Simply bow down on your knees and quietly ponder in order to be in contact with the best tutors available. It is our goal to have every student succeed so we will have our academic coaches, who reside on earth, look after you and offer counsel as needed. We feel that as you progress in this advanced course of study, you will become more enlightened and understand our decisions regarding your enrollment. You should feel free to contact us again, however, please note that our decisions are final on this particular matter. We are fully confident that you will eventually find joy in this new endeavor.